SEO and PPC : What is better for Your Business? SEO and PPC: What is better for Your Business? Only building your online presence will not help you out to get success. In the online marketplace, you have to compete with your competitors which are huge in numbers. To secure good results in search engines is much arduous. But, in order to engage more traffic on your website, it is necessary to get higher search rankings. There are many techniques to get your website in higher search rankings. Some of them are SEO, PPC, SEM, and SMM. But, in this post, we will discuss SEO and PPC, that which one is better. The main difference between SEO and PPC is by applying SEO techniques you can get organic traffic to your website. And, with PPC you have to pay to get traffic to your website. Let us first discuss in brief about both before moving forward. SEO ranks are decided by search engines based on the pertinent content and keyword. By exerting different techniques and tactics, websites are able to rank higher. Some of the techniques are legitimate meta description, eye-catching title, pertinent content and likewise. In this, for the same keyword advertisers bids against the bids of other advertisers. And, the one who bids higher wins it. When you search for anything, PPC ads appear on the topmost lines of the search results. 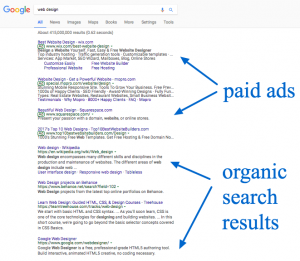 One main difference between organic results and paid results is that paid advertisements are marked as an ad. Both the techniques are optimum at its own place the only difference is one is paid and the other one is not. It is much strenuous for startups to select one out of the two techniques that is SEO and PPC. You can compare by comparing some of the aspects like which gives faster results, which one is good for investment, and likewise. So, we are going to compare both based on different factors. It is one of the most vital question that which one is better either PPC or SEO for conversion? The answer to this question is the visitors come from the paid search results are more likely to get converted but only if your ads are highly targeted. The main reason behind this is web page can rank for different keywords. It is not necessary that it will rank only for the intended keyword. So, in that content, visitors may not find something relevant. But this is not the scenario with PPC, so only the interested visitors will click on the link. It relies on your knowledge and experience. Neither SEO nor PPC is easy if you do not have knowledge of them. If you are a fresher in this stream then you can browse the web for gaining knowledge about this. SEO is such a process that may take much time, it will take months or even years. It means you have to target specific keyword and results are shown to you after months and years. It might also be possible that no results will be shown. In PPC, If you want to do it by yourself then you have to do some course. You can also hire a PPC expert. Which one is better to bring more traffic to your website? The answer to this question is SEO will bring more traffic to your website. As in organic traffic, you are targeting the keywords and as a result, you will get much more traffic as compared to paying for that keyword that is using PPC. But this is only true when you will get higher search rankings. Since your website is shown in the topmost search results, therefore, you will get more traffic. But, it is much arduous to get rankings in the first page as there is a creaky competition in the online marketplace. When anyone searches for anything then they do not actually want to buy a product or avail for a service. Simply, they are in a quest for a credible source to buy products or services. As you all know that consumer wants to buy things from a renowned company or store. And, it is a clear notion that the companies which are already established will invest in PPC. So consumer might move forward to buy from PPC ads. But some of them also believe that it is only for advertisement purpose and move towards organic search results. It varies from person to person. If you regularly update your website with content then it is good for having higher search rankings. When you target a keyword for about six months to one year then you might get good search results. And, if you are sharing your website content on social platforms then you will get higher search results. Use of backlinks will also prove advantageous for you. But, SEO will take more time to show you results. In PPC, you can see results immediately, but only when you have designed an elegant landing page. But other factors also matters like legitimate content, the title of your post and likewise. Also, you have to encompass some call to action so you have to include contact forms and number. In SEO, after waiting for months and years also you are not certain that you will get desired results or not. Google give ranks to a website based on some algorithms. It simply means that your website will certainly move to lower rankings. Sometimes, the condition is even worse, that is your site might be removed from the index. It is the scenario when you adopt black hat SEO techniques. In the World of PPC, you need not trouble when there is an update from Google. As you are aware of the changes all are in front of you. Just you have to give your 5-10 minutes to set up an ad and a little bit of time to see that it is approved or not. In this, you also get support from Google. Both SEO and PPC have their pros and cons. It completely relies on you which you want to use. If you want higher traffic then you can use both SEO and PPC at the same time. If you own a start-up company then opting SEO techniques is good. And, If you are the owner of an established brand name then you can adopt both techniques. It completely depends on your budget and your requirements.